Akita and Aomori, located in northern Japan (Tohoku), are famous for their beautiful winter scenery. However, there are splendid cityscapes, art, and festivals you can explore here. Join us on our winter trip to Hirosaki, Oga, and other great places! Aomori and Akita - So Exciting in Winter! Aomori and Akita are well-known for their great festivals, the Aomori Nebuta Festival and the Akita Kanto Festival, which happen to be two of Tohoku's three great festivals. These events are held in summer, a season full of excitement when thousands of people come to join the fun. But, happens in winter here? You might imagine a somewhat lethargic scenery, covered in white snow. On the contrary, Aomori and Akita are full of excitement in winter, too, with art standing out against the snowy landscape, and heart-throbbing festivals! In this article, we introduce must-visit winter places in Aomori and Akita. We are sure that the wintery image you had up until now is about to change dramatically. Visitors to Aomori can appreciate works of art that are exceptionally beautiful in winter. This is especially the case of Hirosaki, which boasts a rich history of international relations and has taken in Western culture quite a bit. There are many western-style buildings still around in this city. Many exchange students and missionaries from abroad used to live here during the Meiji Period. Hirosaki Castle and park are located in the vicinity of these western buildings. 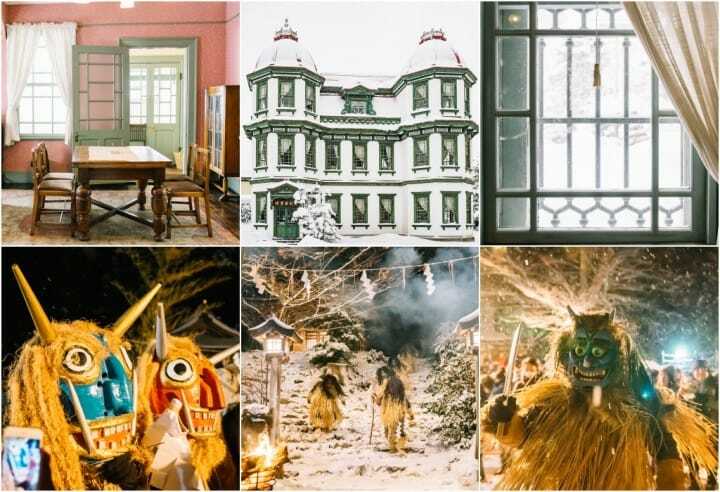 If you head to Aomori, you can visit an art museum with special, winter-only artwork. Let's find out more about these places. The Former Main Branch of the 59th National Bank was the very first bank facility built in Aomori Prefecture. It is a bank-style, sturdy building with a renaissance look. It is also fire-resistant. The dark brown pillars and doors stand out on the outside, and the interior feels pleasantly cozy. This building was once used by the post office workers and was bustling with people. Nowadays it exhibits important materials and documents of historical value. Touching the counter, I felt I could see glimpses of the staff who used to work here in the past. Access Take a bus from JR Hirosaki Station for about 10 minutes; get off at Shitadotemachi bus stop; walk for about 5 minutes. The Former To-o Gijuku Missionary Residence was built as a lodging facility for teachers from abroad who worked at the first private school in Aomori. The exterior of the building was reconstructed to resemble the original. In each room on the 2nd floor you can see beds and daily utensils, as well as the photographs of the teachers who used them. It feels as if the wonderful time those hardworking teachers had is still lingering in this facility. Access Take a bus from JR Hirosaki Station for about 15 minutes; get off at Shiyakusho-mae-koen-iriguchi bus stop; walk for about one minute. The Former Hirosaki City Library is another renaissance building. With an octagonal roof and twin towers, the building looks exactly like a fairytale place. The lovely colorful interior is very cozy and you'll want to sit on one of the wooden chairs reading. Please keep in mind that the tables and chairs inside the library have been here for a long time now, so they should be treated with care. There used to be even more beautiful buildings in Aomori but only a few can still be seen today. Still, next to the Former Hirosaki City Library you can take a look at the Miniature Structure (Japanese), a series of miniature reconstructions of buildings, ten times smaller than the originals. These fourteen miniatures are displayed in the Otemon Square. Thanks to them, the scenery of the past isn’t completely lost, after all. Access Take the bus from JR Hirosaki Station for about 15 minutes; get off at Shiyakusho-mae bus stop; walk for about one minute. Hirosaki Park is located close to the western buildings. It is a great place to view beautiful cherry blossoms in spring and a pearl white world in winter. The cherry trees on both sides of the moat get covered with snow in winter, so their drooping branches appear as if cherry blossoms made of snow are in full bloom. Even the reflection of this scenery in the water is beautiful! The Hirosaki Castle Tower that can be seen in the park is one of the twelve remaining castle tower structures in the country. The wonderful sight of the snow and the castle in one frame is a winter-only scenery that you should definitely experience. The building occupied by Starbucks Coffee Hirosaki Koen-mae is actually one of the Tangible Cultural Properties of Japan. Built in 1917 for military purpose, this structure served as the official residence of the 8th Divisional Commander. The interior is still the same as it was before. The pictures displayed inside help maintain the nostalgic Taisho period (1912-1926) atmosphere. The building was constructed using Japanese beech from Aomori and is decorated with embroidered ornaments made locally, so the entire structure has an atmosphere that is very distinctive of Aomori. Savoring hot coffee in peace inside a tangible cultural property – wouldn’t this be the ideal grand finale of a Hirosaki tour in search of beautiful buildings in winter? Access Take the bus from JR Hirosaki Station for about 10 minutes and get off at Shiyakusho-mae bus stop (Hirosaki City Hall Front bus stop); walk for about 4 minutes. About 18 minutes by foot from the Chuo-Hirosaki Station. Thanks to its pure white appearance, the Aomori Museum of Art looks like a beautiful piece of snow art itself. The museum hosts a generous collection of works by two great painters born in Aomori, Shiko Munakata and Yoshitomo Nara. “Aomori dog”, a piece of art created by Yoshitomo Nara is the very symbol of this museum. In winter, snow piles up on the drooping head of the Aomori dog, making it look as if it were wearing a hat. This snow hat can be seen as a gift from the winter of Tohoku. Access Take the transit bus Bus Nebutan-go from the eastern exit of JR Shin-Aomori Station for about 10 minutes; get off at Kenritsu Bijutsukan-mae Station. In the mountainous area of Oga, in Akita, winter brings along the frantic preparation for a certain festival. On the other hand, if you head to the city, you’ll find hot springs and a winter fairytale-like railway scenery. So, let us find out more about Akita's exciting destinations. Akita' Oga area has a local New Year tradition during which masked creatures called Namahage visit the houses of the locals shouting and making a terrible noise. It is said that the Namahage are joy-bringing spirits (Raihojin) that visit people to warn them not to become lazy. It is also believed that, if the head of the household tries to pacify the Namahage with food following the traditional rites, they will bring good health and safety to the family during the new year. In 2018, the Namahage tradition of Oga was registered as UNESCO Intangible Cultural Heritage. In February each year, the two traditions of this city, Saitosai and the Oga Namahage, are celebrated together during the Namahage Sedo Festival. This is a winter event of great importance for the community. The festival venue is Shinzan Shrine. On the day of the event, many people gather here around to wait the arrival of the Namahage. The first part of the events consists of a dancing and taiko drum performance of the Namahage. The main event starts after a series of such performances. There is a spotlight on the top of the mountain at Shinzan Shrine, and 15 Namahage appear with roaring sounds when the torch is lit. After that, they descend the mountain to mingle with the guests of the festival. Finally, they drink the sake prepared by the miko (shrine maidens) and after they take the sesame rice cakes brought as offerings for the gods, they return to their rightful place, deep into the mountains. Afterward, the Namahage show themselves to the spectators once again. The children that were afraid at first and screaming, can be seen now chatting, playing, and taking pictures with the Namahage, having the time of their lives. This festival is really exciting, lit by the passion and enthusiasm of the visitors and of the Namahage. Business Time Second Friday, Saturday, and Sunday in February. If you’ve had your share of excitement at the festival, how about heading afterward to Oga Onsen? This is a one-thousand-year-old hot spring village, where you'll find another type of heated atmosphere, which is just as hot as the one at the festival – the hot springs. During the festival season there is a shuttle bus heading to Oga Onsen, so you don’t have to worry about the weather conditions. Accepted Credit Cards Differs for each hot spring facility. Access Ride the taxi from JR Oga Station. You can make a reservation for the taxi here. Akita Nairiku Line is one of the must-visit places in winter for any railway-enthusiast. Even if there are piles of snow on the both sides of the train, it still gallantly pushes forward across the railway bridge up high. The view of the Akita Nairiku Line train dashing through the endless snow scenery is really spectacular. Its energetic driving force is mesmerizing and has become a symbol of winter in Akita. **Please mind that the hours are subject to change. WiFi WiFi is available in the express train cars. For those who wish to explore Akita and Aomori up and down, we introduce the best ally there is – the JR EAST PASS (Tohoku Area). With this one ticket, you get unlimited rides on Shinkansen, rapid local trains, rapid-transit trains, regular trains, and JR buses. For more information on how to purchase the pass and other details, please refer to the official page of JR EAST PASS (Tohoku Area). **The JR EAST PASS is available for purchase for visitors to Japan only. Please be aware that Japanese citizens and residents who don’t have a travel visa cannot use this ticket. This is a suggested itinerary for a 5-day Tohoku trip using the JR EAST PASS (Tohoku Area). You can change the order of the destinations, and adjust the itinerary to fit your own schedule. Please keep in mind that winter in the Tohoku area can be really harsh. Therefore, don’t forget to dress appropriately for the cold weather. **Show the JR EAST PASS (Tohoku Area) when using the Akita Nairiku Railway to get a discount. Akita Dogs, Tohoku Cats, And Miyagi Foxes - A Warm Winter In Tohoku!